Let's just get this straight. 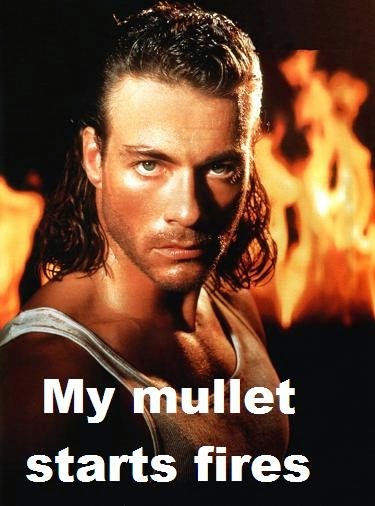 Forget his flexibility, Van Damme had THE best mullet ever. His mullet might be the only time a mullet has been successfully pulled off in the history of cinema. Look at Hard Target. Why, if it weren't for Van Damme's mullet the film would have no action appeal whatsoever (just like this clip from the director's cut). It would be the same old boring blah blah whatever movie that would be forgotten minutes after seeing it. It would have been a literal snoozefest. Let's face it, his mullet carried that film.